We are pleased to announce our appointment as the exclusive Canadian distributor for the BEACHTEK line of audio adaptors for HD-DSLR and camcorders. 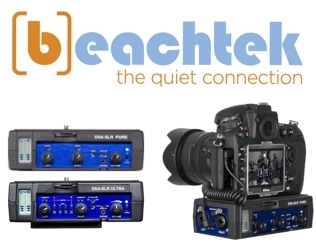 BEACHTEK audio adapters make it easy to connect multiple professional grade microphones (and/or consumer models) to any HDDSLR or Camcorder with a mic input and record directly to the camera’s video file. Amazing sound without the need for syncing in post ! The BEACHTEK line or audio adapters for cameras is a household name in the industry and an ideal companion for our RODE Camera / Broadcast microphones.Now both under the same roof. Meet the new Ultrasone PERFORMANCE series !